Surprise visitors and passersby with the crocus-like flowers of Colchicum in the late summer and fall garden. 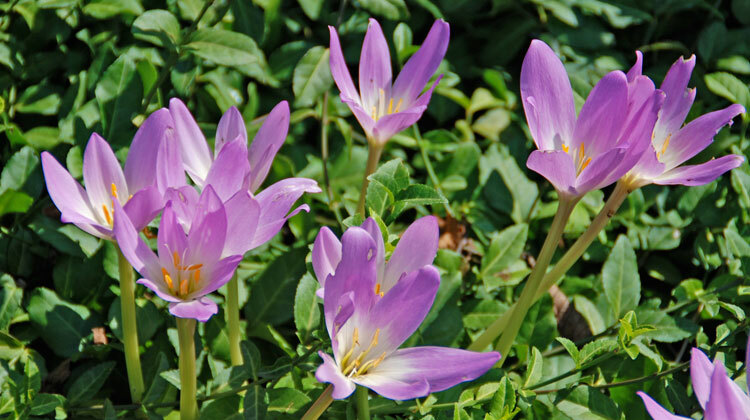 Colchicums, also known as autumn crocus, grow leaves for six to eight weeks in the spring. The leaves dieback and just the lavender pink flowers appear in the late summer or early fall. Hardy in zones 4 to 8, they grow best in full sun or partial shade. Plant them where the declining leaves won’t detract from your spring garden’s beauty yet the 6- to 8-inch-tall flowers are visible in fall. Plant them among groundcovers or spring-blooming perennials for added late season color. Or mask the foliage with spring-planted annuals that blend nicely with the fall flowers. Purchase and plant the bulbs in late summer or early fall as soon as they are available. Watch for flowers the first fall and leaves the following spring. A bit more information: Surprise lily has a similar growth habit. It sprouts long strappy leaves in spring then dieback. In late summer, long leafless stalks appear topped with lily like blooms.